The quarterly Phenova WS Studies were developed to help you meet your WS accreditation requirements. Phenova designs PT standards that allow your drinking water facility or laboratory to meet the Safe Drinking Water Act and statespecific drinking water requirements. 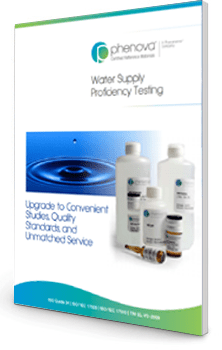 Couple these studies with our whole-volume Water Supply Microbiology (WSM) suite of standards for your comprehensive drinking water PT solution. Need help with your study? Send us your list of certifications and/or standards and one of our technical specialists will present you with a thorough analysis of your PT program with recommendations for better efficiency and/or savings. Phenova provides monthly microbioical PT studies for both Water Pollution and Water Supply. Our whole-volume standards save you time by eliminating a rehydration step.